Like all underground cables, cables in tunnels produce zero external electric field because the individual conductors are sheathed in metal. But what about the magnetic fields? The extra depth - typically 20 to 30 metres below ground - means that the cables are further away and the fields at ground level are much lower, generally within or below background levels from other sources and therefore difficult to detect. We have included a full range of depths for completeness. But a tunnel would rarely if ever be as shallow as 10 m. 20 or 30 m are typical depths. At these depths, the field is a maximum of around 0.1 µT - within the range of fields found in homes from other sources, which is usually stated as 0.01 - 0.2 µT. The cable we have chosen here is an old one in the tunnel under the River Severn. It has the individual conductors spaced by a bit over 0.6 m. The standard value for new cables is 0.5 m, so the fields they produce would be slightly lower. This calculation is for 500 A in each circuit - the same value as most of our other comparisons of fields, and chosen because it is close to the average field for UK transmission circuits. The rating of an underground cable can be 1600 A or 2000 A, so the maximum field would be larger than shown here. Cables, like any other circuit, only rarely operate at rating - but when they do, the field a tunnel installation produces at ground level could start being above the background level, though still lower than from an equivalent overhead line or direct-buried cable. 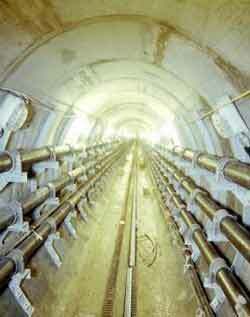 Like all our calculations of underground cables, we have ignored zero-sequence currents and sheath currents. This means the actual field - particularly at the greater depths - could be slightly larger than calculated here.